Get your review request listed here on The New Book Review blog (no charge). Send me the elevator pitch describing one of your books and asking for a reviewer for it. The pitch should be no longer than 50 words. Follow the format below and send your request and description to tales2Inspire@optimum.net with REVIEW WANTED in the subject line. Make sure the book is already listed at Amazon.com. DESCRIPTION: A homeless vet is beaten to death by police. Protests erupt. 3 cops are gunned down. A multi-state manhunt. And the trial of the decade. A new kind of legal thriller. DESCRIPTION: True stories of fifteen Awesome Kids, each making an incredible impact to better our world. Reviewer must commit to writing a review within 30 days, posting it on Amazon, and giving author permission to post it on the New Book Review blog. "Tales2inspire was a kernel of an idea that i started in 2012, which has grown to proportions even i didn’t dare to envision. my innate curiosity about potentially fascinating human interest stories was the spark that ignited this idea, but it was the confused state of traditional publishing that propelled me forward. Tales2inspire delivers exactly what it promises as both an ‘authors helping authors’ project and a contest. Winners get their stories published in print, e-book and some even in video formats, with their names, headshot photos, and mini-autobiographies included. Then i continue to spread the word about the winners and their stories on my blog, social media and monthly newsletter. Free to enter, this is a great competition for talented newbies and seasoned authors alike. " Gary and Carolyn Wilhelm read the paperback and listened to book on Audible, and here is what they thought. I have listened to the Audible version and also read the book. Both experiences were quite different to me. 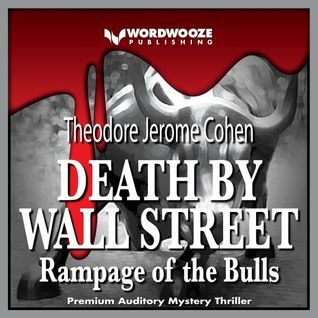 The audible version was an intense experience as the oral reader had the perfect voice which matched the genre, mystery suspense thriller -- which kept me on the edge of my seat although I had read the book. It would be good to listen when you have some time or want to exercise as it is not relaxing to hear about the stock market and healthcare "cure" corruption. It is fiction based on real events and it seemed more like I was an insider to the plot when listening to the spoken word. I felt more "in" the story through the listening experience. The book is good when you want to read quietly. I thought this book was going to be a story about financial information of stock market manipulations by big companies, but it also delved into the healthcare industry. If you have ever lost a loved one to cancer or knew someone who needed a promising drug, this is a must-read. Nonfiction events are woven into a narrative to enlighten the reader about how big pharmacy works while newer drugs with proven track records are defeated. Ill people need help and this book is discouraging about Wall Street, Washington DC, and big pharma. A sad story that teaches the information voters should make informed decisions -- if only the "little people" had more power. The author worked to make this information entertaining and exciting while revealing disturbing information and truths. Great read! The author worked to make this information entertaining and exciting while revealing disturbing information and truths. "Important Information for Voters of Our Time"
I just finished listening to this great Audible version of the book. Listening is a more engaging experience than simply reading quietly. The story information, while entertaining, is also based on nonfiction events surrounding especially the 2008 financial disaster and supposed cancer "cures" being widely promoted. The greedy truth behind this story is alarming. So much corruption went on and goes on.I hope this book helps others prevent or be taken advantage of by money schemes and schemers. Thanks for this truth! 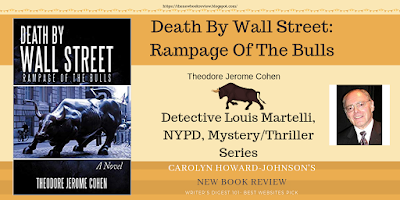 Louis Martelli is a detective with a leg disability and yet is so clever and cunning as to be able to expose the criminals. He out-thinks everyone else and solves cases with finesse. Criminals walk right into the traps he sets. The way the surveillance camera was placed was hysterical. The fact cancer drugs are more about greed than healing could make anyone cry. My first serious introduction to self-publishing was at a SPAN conference in Atlanta (Small Publishers of North America); it was there I was introduced to a very fat volume on self-publishing by Marilyn Ross that included the idea that real publishing includes marketing. She also applauded speaking as the best way to market a book—read that as the most assured path to success. Since then, I have recommended a couple of super speakers’ books to my clients and in the appendixes of my #HowToDoItFrugally Series of books for writers and I’ve pointed to the writing (and speaking) career of the late Dan Poynter as an example of how well speaking benefits a writing career—and vice versa. 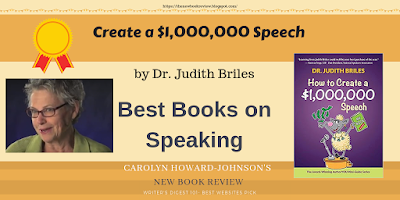 Now, years later, Dr. Judith Briles, adds her How to Create a $1,000,000 Speech to the battery of my choices for “Best Books on Speaking.” And trust me, it is not a battery, but a very short list! Though this book's title may seem as if it is promising more than speaking can deliver, it is not. 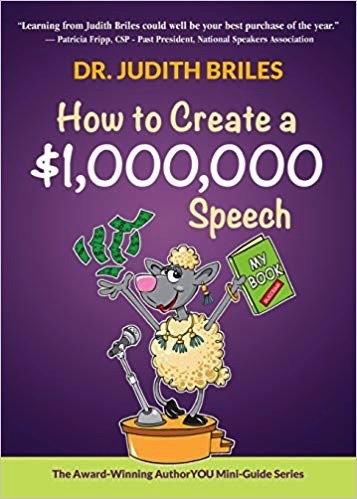 I have seen speaking make many authors a ton of money over the years and build writing careers as it does so. One side benefit that always appealed to me: Travel. Have I convinced you of the possibilities? Then the next step is to study up. May I suggest you start with Briles’ book? For the fun of it. For the enthusiasm and inspiration between those royal purple covers. And for the all-in-one-place advice you’ll get on the process of speaking as a marketing technique. WANT REVIEWS FOR YOUR BOOK? 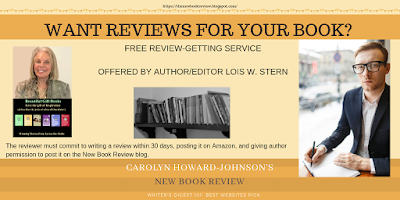 Get your review request listed here on The New Book Review blog (no charge). Send me the elevator pitch describing one of your books and asking for a reviewer for it. The pitch should be no longer than 50 words. State format of book (paper back, pdf, e-book). Follow the format under REVIEW WANTED, below, to include all of the required information and send your request and description to tales2Inspire@optimum.net with REVIEW WANTED in the subject line. Make sure the book is already listed at Amazon.com. You must be willing to send a book (in whatever format(s) you list below) and promotional materials to anyone who contacts you. Those who offer paper copies of their book are more likely to attract a reviewer. Just make it short, describing the book in a few words. Lengthy submissions will not be posted. Reviewers only need enough information to see if they have expertise and an interest in your category. Supply full contact information including your name and email address. Write the draft as it should appear so that we do not have to do more than Copy\Paste. Lois is a multi award winning author whose work has been featured in the New York Times, on Local Access TV and in live presentations in many varied venues. She has now published eight Tales2Inspire books of her contest winners' stories. 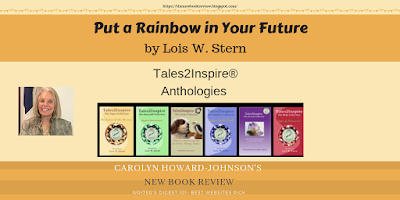 Fans of Chicken Soup for the Soul are particularly enamored of Tales2Inspire books, because aside from their inspirational themes, they are filled with original photos to enhance the power of each story. 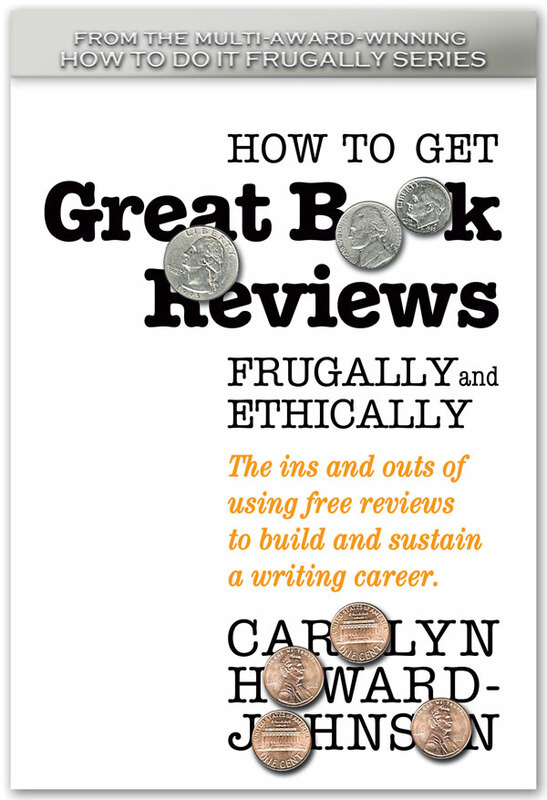 The New Book Review is run by Carolyn Howard-Johnson, author of the multi award-winning HowToDoItFrugally series of books for writers. It is a free service offered to those who want to encourage the reading of books they love. That includes authors who want to share their favorite reviews, reviewers who'd like to see their reviews get more exposure, and readers who want to shout out praise of books they've read. Please see submission guidelines on the left of this page. Reviews and essays are indexed by genre, reviewer names, and review sites. Writers will find the search engine handy for gleaning the names of small publishers. Find other writer-related blogs at Sharing with Writers and The Frugal, Smart and Tuned-In Editor. "Juliette Dreschler awakens to a startling reality. She is only a shell of the woman she used to be after a life-altering accident left her both physically and mentally changed and now someone has marked her for death." Terminal Identity shares the fictional (based on real life) experience of a family who is dealing with a traumatic brain injury. Not just a TMI, but an international thriller mystery as well. This true explanation is briefly mentioned in the author’s note at the end of the story. We have a relative who experienced three falls, and with only a mild TBI has fairly significant challenges – organizational issues and distractibility -- which make it difficult for her to be productive. The story was based on fact, although many people have more than the minimal impairment of the character Juliette. The story rang true for me, which I liked. One character has to split his time between visiting the hospital, working with the Police, and meeting with a private investigator. The family also has to divide their time especially as the story happens in both Switzerland and the USA. The different time zones, distinct hospital rules in two countries, and necessary international travel complicate the story for added suspense. Romance adds to the story. 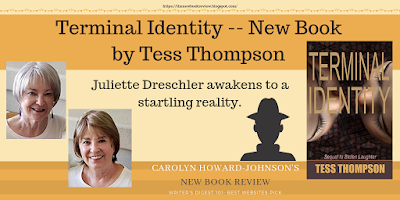 A stolen identity is revealed near the end of the story, and it not at all what I first would have imagined -- if I had seen it coming. The plot has plenty of surprises as it moves right along. Some suspicious characters that seem guilty are not, It is hard to know which people can be trusted. One part of the story-within-the-main-story I enjoyed was about the adoption of a baby. I am partial to adoption stories with an adopted daughter myself. A play within the play, so to speak. One of the main bad guys is a doctor that you will love to hate! Poet Aline Soules Calls Carol Smallwood's Chapbook a "Universal Collection"
In her first piece, “A Visit from Caesar’s Wife”, Smallwood writes: “Avon made me feel a part of things: it was as American as McDonald’s, the Fourth of July, or the Reader’s Digest.” This sets the tone of the entire eclectic collection and the evolution of her world. In her memoir about a relative, she recalls Christmas in Poland where the table was set with hay under the tablecloth, the common shepherd who was fed in turn by each villager, the swing used by the whole village, and a beautiful brook where the author waded. It’s a far cry from a family that grew flax, spun linen thread, and made cloth on a loom to the modern American woman who later writes a piece called Wendy’s where she read the Canterbury Tales over chili, a baked potato, and a senior Diet Pepsi, and observed tabloid headlines like “3500-Year-Old Mummy Gives Birth.” A woman who observes the humanity around her, wondering if a young teenage couple in line will turn into another couple with kids at a back table. The author ends the collection with an epilogue, a poem called “Passage,” which she starts with “summer ice, pleasure of the moment: / proof of time’s passage” and ends with “evaporation could be measured / if there were days enough—/but ice has many forms.” The momentary nature of time and the multiplicity of forms, whether of ice or passages, makes this a universal collection. Lean more about her on her blog a http://alinesoules.com/blog or at Twitter (@aline_elisabeth). 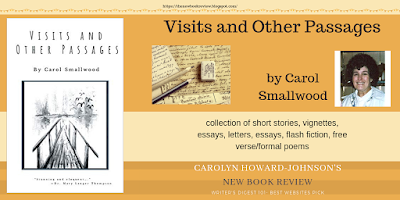 Her work has appeared in such publications as Literature of the Expanding Frontier, Kenyon Review, Houston Literary Review, and Poetry Midwest. Review: "I just finished reading Kellcey, by Kacey Kells. This book is an important contribution to the MeToo movement and should be required reading for every high school senior or college freshman. Kells describes an idyllic childhood transformed by tragedy that affects each family member in profound ways. Filled with loneliness and often isolated, Kellcey turns to a relationship with an older boy of whom her mother approves. Unfortunately, Ben’s friend, John, makes crude remarks around Kellcey and Ben has to step in to prevent him from acting on his unwanted advances. This early glimpse into a culture that objectifies women at extremely young ages and teaches boys that this form of toxic masculinity is normal, is difficult to read emotionally as it is so relatable to many women. I could also relate to much of the landscape in this book, as I have visited the locations where Kellcey lives and travels. Tofino, with its magnificent trees and parks, brought back many fond memories for me, yet set against this backdrop of natural beauty is an escalation of misogyny that will make readers feel incensed once again. Alcohol is often used as an excuse for the mistreatment of women, including name-calling and sexual assault. Unfortunately, none of these events are unrealistic for our everyday interactions. They are all too common and Kells does an excellent job of detailing them using imagery that makes the reader recoil with disgust. Without inserting too many plot spoilers, Kellcey not only bears witness to what countless other women have gone through, but also offers a message of hope. Kells is clear when she characterizes Kellcey as a resilient young woman who is brave enough to speak her truth, face it, and work to heal. I applaud the author for her courage to write such an honest story and look forward to reading her future publications. A definite 5-stars from me!" J. G. MacLeod, an author and secondary teacher and says , " I even . . . [use "Kellcey]" in my classroom and encourage my grade 12 students to read it." Learn more about her on twitter @jgmacleodauthor , her website, jgmacleod.com, and Goodreads, https://www.goodreads.com/review/show/2479609695.